Berthed in Cartagena Regatta Club over winter. Would like to start heading east into the Med from 22 Feb, weather dependant. Love the on water and under water activities. Fishing, scuba, free diving. Have all of the scuba and fishing gear on board. If its raining, bring a book. If it's sunny and good weather, bring some fun! 6 month old yacht - wanting to keep it clean and tidy. Would appreciate your assistance with this. Prefer crew with unrestricted diet. Don't care if you smoke - just not on my yacht! Drinking OK just not on passage. Have lots of toys on board. Lets play! Boat descriptionShe is a 6 month old 38ft sailing Catamaran fully kitted out for off the grid living, with all the electricity and all the hot and cold fresh water you could poke a stick at. The yacht is clean and tidy, but she is a boat that is lived on and sailed! Love exploring, snorkelling, diving and fishing as well as checking out local sights, food and drink. Also love photographing all of this! Easy going but always safety conscious. I'm currently berthed in Cartagena Regatta Club over winter. 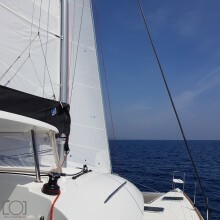 Still wanting to get out for day trips and overnighters in secluded bays and would love some help with boat handling... Would like to start heading east into the Med from 22 Feb, weather dependant. In the mean time, cold water - bigger wetsuit! Diving, fishing, chilling... If its raining, bring a book. If it's sunny and good weather, bring some fun! 6 month old yacht - wanting to keep it clean and tidy. Would appreciate your assistance with this. Flexible with embarkation and disembarkation and happy to work something out with cost sharing for the right person... Come and play! Assistance with boat handling when underway, mooring & anchoring required. Happy to work out the details upon meeting the right person! Thousands of miles of boating and sailing under the belt. Picking the weather windows to go and play. Enjoying what the area has to offer in between! The yacht is clean, comfortable, very safe, very spacious... Looking to share experience, visit remote places, seek adventure, learn a language, live off the grid... Fluent English, viel Deutsch, poko Espanol.